Serve with the garlic mayonnaise and a salad on the side. Place the baby potatoes in a pan and just cover with water then bring to the boil and cook for 8 minutes until just tender. Drain and allow to cool slightly, then half the potatoes and set aside. 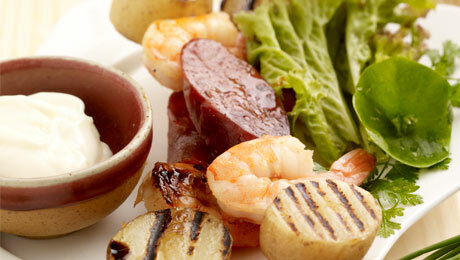 Cut each chorizo sausage into 8 pieces, then thread the potato, chorizo and prawns onto each skewer. Place the skewers onto the barbecue and cook for 4 minutes on each side and serve immediately.